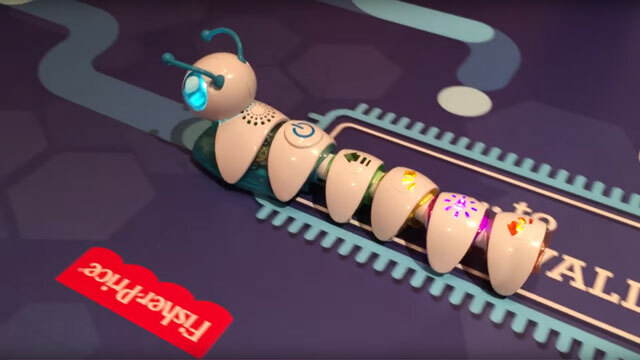 At CES 2016, in Las Vegas, Fisher-Price showed off its new Think & Learn Code-a-Pillar, a toy targeted to preschoolers that aims to teach the foundational skills of coding, through problem solving and sequencing. The Code-A-Pillar is constructed from individual segments, each with its own programming command—-forward, left, right, or pause and play music. Kids can organize these segments in any way they desire to send the caterpillar along its path. The Code-A-Pillar comes with 8 light-up segments, including the motorized head segment. Additional add-on segments will be sold separately (no word yet on what those will be). A future companion app will offer children to enforce specific learning goals, like counting and patterning. Fisher-Price is recommending Code-A-Pillar it for the 3-8 year age range. I would guess that skews a little old, and it would probably be most entertaining for the 2-5 year old crowd (the 3-year cutoff may be due to small parts that could create a choking hazard). Code-A-Pillar will be available starting in June at a price of $49.99.